. . . this is an eloquent act of homage which cannot fail to move. At times, these pieces are almost unbearably moving, with lyrics talking of farewells and suffering, along with beauty and hope. The fact that each of the musicians who composed these pieces died in the camps makes it even more of a poignant listen. Best known today is Viktor Ullmann, three of whose Six Sonnets are sung hauntingly by von Otter. Many of the items are terrifyingly cheerful. Among the musically most interesting are Hans Krása's Rimbaud settings for baritone (Christian Gerhaher), clarinet, viola and cello. The most touching are the songs by Ilse Weber. 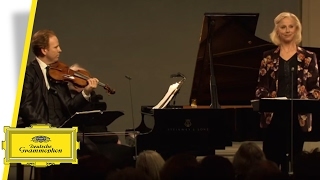 Violinist Daniel Hope plays the brilliant solo sonata written in 1927 by Erwin Schulhoff . . . This fascinating selection of music tells a grim story . . . Swedish soprano Anne Sofie von Otter captures the lilting pathos of music . . . Violinist Daniel Hope concludes the disc with a grippingly virile solo sonata by Erwin Schulhoff . . .
. . . it is easily the most thoughtfully programmed and performed [survey of music from Terezin] . . . Anne Sofie von Otter conveys the diversity of life at Terezin . . . as does Hope's coruscating account of Erwin Schulhoff's 1927 Violin Sonata.
. . . this hugely important disc pays tribute to the musicians of Theresienstadt (Terezin, in Czech), the concentration camp near Prague, where many members of the Czech-Jewish artistic community were held before transportation to Auschwitz. It adds immeasurably to our understanding of the remarkable artistic flowering within the camp by focusing primarily on works for voice with piano or instrumental ensemble. Every track forms an assertion of human dignity in the face of unspeakable suffering . . . Von Otter and the phenomenal baritone Christian Gerhaher share the songs between them. Bengt Forsberg, von Otter's regular accompanist, is the pianist, though there are also outstanding contributions from clarinettist Ib Hausmann and guitarist Bebe Risenfors. This disc is rounded off with Daniel Hope playing Erwin Schulhoff's Sonata for Solo Violin. Impossible to get through without tears, and completely unforgettable. They give honest accounts of this music where the circumstances of its composition could so easily lead to an over-emotional approach. They both -- von Otter in particular -- cope admirably with the range of languages involved: Czech and Yiddish beyond the more familiar German and French. Although Erwin Schulhoff is one Czech composer of the time who did not pass through Terezín, the life-enhancing energy of his Solo Violin Sonata (1927) in the hands of Daniel Hope provides a fitting epitaph for this lost generation.
. . . this is an album that transcends criticism and must be heard . . . Theresienstadt is as dreadful as the world has offered. So when listening to von Otter singing a haunting lullaby composed by a nurse who opted to go to the gas chamber with the children in her care, and sang them to their last sleep with this same song, there is no way but tears. Essential . . . The music on this CD is beautiful, some of it comic, some of it elegiac; all of it almost unbearably touching . . . Anne Sofie von Otter sings them with exquisite tenderness; Bengt Forsberg at the piano and Bebe Risenfors on guitar accompany lovingly . . . Christian Gerhaher sings the Krása and Ullman with noble spirit. The recital concludes with Erwin Schulhoff's 1927 Sonata for solo violin, played by Daniel Hope with energetic panache. It really isn't possible to listen to this disc, or indeed to review it, in anything but a state of wonder at the bravery and majesty of these persecuted and martyred musicians. Everyone should hear it. Von Otter is one of the most successful and diverse sopranos of present times . . . behind the frivolity of many of her performances lies a pensive detachment that hints at a darker side . . . Both the songs and her delivery have a simplicity and a directness that are instantly affecting. Nothing in this album sounds like a performance, more like the transmission of an essential truth, the work of a recording angel . . . Baritone Christian Gerhaher does them more than justice on this recording, while Gerold Huber relishes the highly individual colours Hass conjures up in the piano parts . . . it's the newer names that make this such an important recording in both a musical and a historical sense. It is impossible not to be moved by Ilse Weber's plain and simple songs . . . Anne Sofie von Otter has the pianist Bengt Forsberg for the lullaby "Wiegala" and its hint of Schubert is almost unendurable . . . The simplest songs bear witness to the courage and the uncompromised humanity of those who passed through Terezín on their way to almost certain death, just as much as the more sophisticated music on this must-have recording. This recital of songs and chamber works brings a broad range of the repertoire to life in performances of the deepest insight and sincerity. "Terezín" . . . can illuminate our darkest hours. Throughout, Ms. von Otter and Christian Gerhaher sing with heartfelt simplicity, sensitively accompanied by the pianists Bengt Forsberg and Gerold Huber . . . The fine violinist Daniel Hope offers an intense performance of the Sonata for Solo Violin (1927) by Erwin Schulhoff . . . The frenzied dissonance of the earthy opening movement contrasts with the pathos of the ensuing Andante, played here with soulful eloquence. This is a major release of collected songs from Terezín, and like everything else about the camp, it is both unsettling and uplifting. What keeps this recording from being predominantly the former is not only the beauty and power of the music but the reassuring presence of Anne Sofie von Otter, who performs most of the material. Von Otter is an ideal tour guide; the warm embrace of her voice mitigates the ever-present darkness that overshadows these compositions. She maintains a pure, unself-pitying connection to the songs that keeps the focus on their artistic merit, doubtless something the composers of Terezín would have appreciated.
. . . as always, she grasps the subtleties of everything she sings, from cabaret songs to lamentations, and she is in fine voice. Accompaniments, which sometimes include accordion, guitar, clarinet, cello, or double bass, are superb throughout, creating just the right mood for every song. [Schulhoff's four-movement Sonata]: It's an amazing accomplishment for a single violin, and Daniel Hope makes the most of it. DG's recorded sound is ideal: intimate, warm, clear, and well balanced . . . this is a magnificent disc, by far the most moving of all the samplings of vocal music from Terezín. Every song seems a masterpiece of its kind, every performance one for the ages. It just has to be on my Want List 2008.
. . . DG's disc of mostly vocal music from the Terezín concentration camp demands inclusion. By its choice of repertoire -- light music as well as serious masterpieces -- and the excellence of its performances, it becomes the finest record we have of the vibrant musical life that refused to surrender to the prospect of imminent death. A recital of songs composed in a concentration camp does not suggest much in the way of levity. So it was really only the whiplash goad of a reviewing fee that caused Anne Sofie von Otter¿s disc Terezín/Theresienstadt to end up on my CD player. And then out poured jolly operetta tunes, caustic little cabaret satires, a throat-catching lullaby and a host of other extraordinary surprises, funny and sad . . . can we have more von Otter, please? Innigkeit und Leidenschaft klingen aus ihren Tönen. Und die sorgen ebenso wie die Sängerin und ihre Begleiter dafür, dass die CD "Musik aus Theresienstadt" zum Ereignis und Erlebnis wird. Musik, die einem den Atem stocken lässt . . . Mit dem Geiger Daniel Hope, dem Bariton Christian Gerhaher und ihrem Pianisten Bengt Forsberg ist ihr ein beeindruckendes musikhistorisches Dokument gelungen. Ein zutiefst berührendes CD-Projekt mit Liedern, die im KZ Theresienstadt entstanden sind: "Zur Unterhaltung". Die ganze musikalische Intelligenz Anne Sofie von Otters kommt zum Tragen. Die schwedische Sopranistin Anne Sofie von Otter hat im Laufe ihrer Karriere nicht nur mit ihrer Stimme auf sich aufmerksam gemacht, sondern auch mit bemerkenswerten CD-Produktionen . . . Über alle Genrewechsel hinweg klingt Anne Sofie von Otters Stimme immer freundlich und warm. Da sind kein anklagender Ton und keine Betroffenheitsgesten zu finden. Sie singt die Lieder, so wie sie sind, mit einfachem, natürlichem Ausdruck, ohne die Tragik, die natürlich in jedem dieser Lieder mitschwingt, noch extra zu betonen. So sind es dann auch vor allem die schlichten Lieder, die besonders nahe gehen . . . Ihre Mischung aus Traurigkeit und Schönheit ist es, die die Lieder auf dieser CD so anrührend macht . . . Es ist vor allem die gänzlich entspannte, äußerst behutsame Heransgehensweise der beiden Sänger Anne Sofie von Otter und Christian Gerhaher, die uns diese Musik trotz all der Unmenschlichkeit, die sich durch sie hindurch vermittelt, überhaupt aushalten lässt. Jetzt haben mit Anne Sofie von Otter und Christian Gehaher zwei international renommierte Interpreten Lieder aus Theresienstadt eingespielt, und ergänzen die bisher erhältlichen CDs um eine bewegende Dokumentation . . . die beiden Sänger finden dabei einen guten Ton für die Lieder: zurückhaltend, natürlich, genau. Sie dramatisieren nicht . . ., sondern leihen der Musik aus dem Konzentrationslager einfach ihre Stimme. Sehr angemessen ist das -- und bewegend. Otter singt mit zärtlichem Grauen und finsterer Noblesse. Auch Christian Gerhaher (so in dem zum "Terezin-Lied" umgetexteten "Komm mit nach Varasdin" aus Kalmans "Gräfin Mariza") gestaltet die teils vergnüglichen, teils romantisch zarten Lieder mit elegischer Zurückhaltung . . . Eine verdienstvolle, geschmackvoll realisierte und berührend leise CD, die die Heiterkeit des Grauens, die Abgründigkeit der Unterhaltung im Lager erschütternd schön mit Leben erfüllt.
. . . bei der Schubertiade in Schwarzenberg [hat sie] gemeinsam mit ihrem Begleiter Bengt Forsberg und dem finnischen Geiger Pekka Kuusisto eine nordische Sommernacht mit skandinavischen Kompositionen dargeboten, die vor Temperament strotzte. Pekka Kuusisto . . . hat der Sängerin ein gelöstes Entree verschafft. Frau von Otter ist eine Art Anti-Diva, sie ist groß, blond und blauäugig. Gehabe kennst sie nicht. Sie singt schlank und natürliche und intoniert absolut sicher, pathetisch wird sie nie . . . Sie singt so, als sei das eigentlich keine Kunst, lässt Phrasierung, Stimmbildung und Affekte vergessen, weil alles so selbstverständlich klingt . . . Was sie singt, ist durchdacht und bis ins Detail gestaltet, hervorragend gesprochen. Sie vermag Strahlkraft mit warmem Timbre zu verbinden. Daniel Hope, dem die "entartete Musik" Ullmanns, Krásas und Schulhoffs seit Jahren ein Herzensanliegen ist, spielt dessen Sonate für Violine solo mit fulminant musikantischem Zugriff. Anne Sofie von Otter neues "Terezín"-Album liefert nun ein leuchtendes Beispiel dafür, dass es auch anders geht: Dass man trotz Betroffenheitsbonus selbst Kinderlieder von und für Todgeweihte sauber und geradlinig singen kann. Und sie hat sich dazu erstklassige Kollegen mit ins Boot gebeten. Daniel Hope spielt die virtuose Solosonate von Erich Schulhoff . . .
Eine eindringliche Musik-Geschichtsstunde, die man so schnell nicht wieder vergisst. Im Rahmen einer hörenswerten Neuerscheinung stellt nun die Mezzosopranistin Anne Sofie von Otter die Musik dieser Komponisten vor und präsentiert Stücke, die den ganzen Reichtum des musikalischen Lebens von Theresienstadt widerspiegeln. Für ihr Projekt, das ihr besonders am Herzen lag, konnte sie hervorragende Musiker gewinnen. Unter ihren Gästen ragen Christian Gerhaher und sein Pianist Gerold Huber sowie der Geiger Daniel Hope heraus, der auf intelligent-prägnante, eindringlich-tiefsinnige Weise Schulhoffs Sonate für Violine solo vorträgt . . . Gerhaher singt gleichermaßen subtil wie präzise, mit herrlichem Piano . . .
. . . selbst im Popbereich der ABBA-Lieder versteht sie sich auf ihre Art temperamentvoll auszudrücken. Stets überzeugt sie mit ihrer schlanken, unaufdringlich natürlichen Stimme, über die sich im Lauf der Zeit ein silbrig verhangener Schleier gelegt hat. Ihr Timbre, das an schwebender "Tiefe" zugelegt hat, verleiht ihr eine nach innen gerichtete Expression, die wenig Töne benötigt, um viel mit ihnen zu sagen . . . Otter und Gerhaher treffen den tiefen Schmerz dieser Musik ohne auf Kunst setzen zu müssen. Der hervorragende Bariton weiß auch um den galligen Zynismus des berühmt-berüchtigten Terezín-Liedes . . . Bei aller Leichtigkeit der Form, im Gehalt wie Blei! Die Lieder von Hans Krása, Viktor Ullmann, Pavel Haas und anderen in einer so hochqualitativen Umsetzung zu hören, wie sie diese CD bietet, berührt besonders und hält die Erinnerung an das große, im Angesicht des Todes entstandene Werk der Künstler hoch. Ein gesanglich wie inhaltlich großartiges Album der Starsängerin. Mit einem Aufsehen erregenden und zugleich äußerst einfühlsam initiierten Projekt macht die schwedische Sopranistin Anne Sofie von Otter auf ein Kapitel der deutschen Musikgeschichte aufmerksam . . . Anne Sofie von Otter singt diese Lieder mit einfachem, natürlichem Ausdruck, ohne die Tragik, die in jedem dieser Lieder mitschwingt, zu betonen. So sind es vor allem die schlichten Lieder, die nahe gehen. Der Mezzo-Sopranistin Anne Sofie von Otter ist zusammen mit Bariton Christian Gerhaher, Bengt Forsberg (Klavier) und Daniel Hope (Violine) eine teils anrührende, teils erschütternde Dokumentation gelungen, die manch beängstigendes Fenster in unsere Spass-Gesellschaft öffnet. Kabarett, laute und leise Klage -- arrondiert von Erwin Schulhoffs Solo-Violinsonate -- die Deutsche Grammophon legt eine hochklassige, klug kompilierte Edition vor für eine gute Stunde atemloses Zuhören -- und längeres Nachdenken auch Tage später. Selten wird einem die Vielfalt des musikalischen Schaffens im Konzentrationslager Theresienstadt so eindrücklich vor Ohren geführt. Anne Sofie von Otter und Christian Gerhaher verzichten auf den Betroffenheitsgestus -- und lassen dadurch die Musik umso packender sprechen. Man begreift, welch schöpferisches Potenzial sich hier unter schwierigsten Lebensbedingungen entwickelte. In der differenzierten Herangehensweise setzt die Aufnahme Massstäbe . . . Die Lieder von Ilse Weber gehören in ihrer Innigkeit und leuchtenden Klanggestaltung zu den besonders anrührenden Stücken. Anne Sofie von Otter singt sie mit natürlichem Ausdruck, ohne die darin mitschwingende Tragik eigens zu betonen.
. . . alle Beteiligten [treffen] den rechten Ton, der umso betroffener macht. [Sie] bietet mit hervorragenden Kollegen . . . auf "Theresienstadt" Kompositionen . . . packend, ergreifend -- und einfach wichtig. Anne Sofie von Otter nous porte au c¿ur de la condition humaine dans sa plus inflexible et insolente vitalité . . .
Enregistrement intimiste avec la voix en proximité, une bonne construction et une très bonne définition . . . von Otter et Gerhaher sont ici d'une délicatesse et d'un sérieux incomparables. Avec une simplicité absolue, ils nous portent au c¿ur de l'humaine condition dans sa plus inflexible et insolent vitalité. En tableaux sublimes de poésie mesurée, d'insouciance feinte, la mezzo Anne Sofie von Otter, renouvelle le miracle précédent de son album Korngold (également publié par Deutsche Grammophon). Ici, chaque note, chaque inflexion du chant signifie le désir de vivre et déjà la nostalgie -- déchirure maîtrisée --, d'un monde que l'on doit quitter, atrocement. Otter pousse la gouaille, celle d'un expressionnisme piquant et mordant (Wir reiten auf hölzernen Pferden de Martin Roman) . . . Lui donne la réplique le baryton Christian Gerhaher, habité par une même finesse dans un apparent lâcher-prise (Terezin-Lied) ou âme renonçante touchée par les spectres et les morts du génocide, en un tryptique livide aux couleurs fanées, au panache dérisoire . . . Cet album alterne la complainte et l'évocation terrible à demi-mots, comme une série de perles recueillies, de prières pour la vie, c'est l'expression la plus émouvante de l'âme humaine . . . sobre et délicate diseuse, Otter saisit par sa noblesse et son humanisme émus. Engagement semblable pour les instrumentistes dont le violoniste Daniel Hope, dans la Sonate d'Erwin Schuloff (1894-1942) qui apporte son chant final à ce superbe programme. Ces mélodies . . . sont accompagnées de quelques vaporeuses notes de piano, guitare, accordéon, clarinette ou contrebasse, égrenées avec beaucoup de délicatesse, comme à peine suggérées, qui soutiennent la voix sublime d'Anne Sofie von Otter, si merveilleusement souple et veloutée, au chant tellement fluide et aisé, d'une beauté de timbre à se damner. Cet enregistrement aéré et naturel possède l'immense mérite de nous restituer ce miracle de simplicité, cette atmosphère d'intimité absolue, et toutes les couleurs et les parfums d'un monde au bord d'être englouti par la barbarie. Nous avions remarqué l'excellent violoniste britannique Daniel Hope (né à Durban en 1974) dans un récent programme organisé autour des musiques (bouleversantes) des compositeurs juifs parqués dans l'antichambre de la mort de Theresienstadt Terezin, récent album édité par Deutsche Grammophon avec la mezzo suédoise Anne Sofie Van Otter. Daniel Hope qui y révélait une sublime Sonate d'Erwin Schulhoff, impose ici avec la même personnalité, une nature communicative, son engagement singulier dans le Concerto de Mendelssohn . . . La lecture primitive défendue par Hope regorge d'une tendre vitalité, en particulier dans le mouvement central qui est écrit en mode mineur quand sa version plus récente est conçu en ... majeur. Différence de taille qui magistralement tenue, révèle cette faculté d'introspection et d'intimité à fleur de peau dont était capable le jeune Mendelssohn. Même révélation pour l'Octuor pour cordes: même sentiment d'irréppressible ardeur, une force juvénile, d'une rare passion que les interprètes restituent dans une version corrigée critique, désormais parfaitement légitime. La sonorité du violoniste qui brille par son intériorité et une forme de modestie habitée (qui tranche avec le brio habituel que l'on entend familièrement dans le Concerto), s'impose indiscutablement par sa finesse et son élégance, mais aussi ses qualités de plénitude et de naturel, éléments si essentiels chez Mendelssohn. De toute évidence, nous tenons là plus qu'un "document musicologique": la seule version originale du Concerto suffit à donner raison aux recherches de Daniel Hope. Il est à souhaiter que cette option alternative s'impose durablement sur la scène, aux interprètes soucieux d'exactitude car en mode mineur, l'Andante central sonne divinement, d'une toute autre façon que dans sa version plus récente. Quant à l'allegro con fuoco, c'est bien toute la jeunesse éruptive d'un Mendelssohn tourné vers le soleil qui s'exprime avec contrastes et détermination. Superbe révélation! Watch the trailer for the Terezín / Theresienstadt DVD with Daniel Hope and Anne Sofie von Otter, release on Deutsche Grammophon.